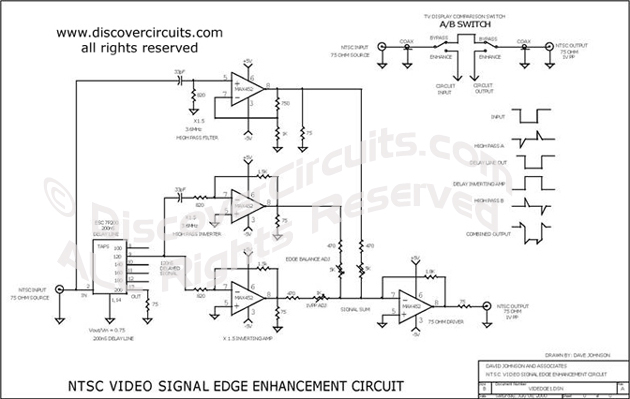 Circuit: VIDEO SIGNAL EDGE ENHANCEMENTS __ Circuit designed by David A. Johnson, P.E. I designed this circuit many years ago, based on the claims that the technique would improve the quality of standard TV images. The circuit adds information to the edges of the objects and was reported to bring out more detail. After building and testing the circuit, I could definitely see a difference between it and a regular TV display but I don’t think most people would go to the trouble of installing the circuit for only a marginal improvement. Still, it is an interesting circuit with which someone might experiment.